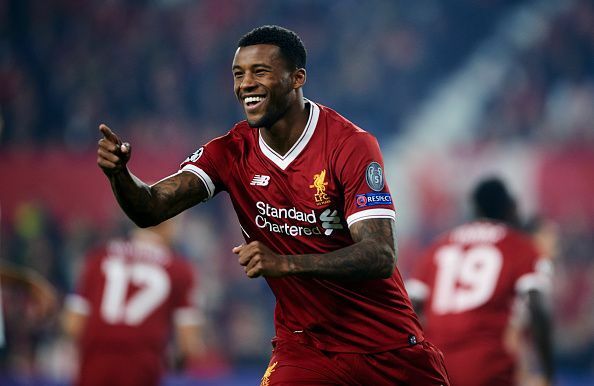 Georginio Wijnaldum is a Dutch footballer who currently plays for English club Liverpool and Netherlands national football team. Born on 11th November 1990 in Rotterdam, the attacking midfielder is known for his versatility on the field. Having represented Netherlands in over 47 games, the player was named Dutch footballer of the year for the 2014-2015 season after carrying Netherlands squad to a third place finish in the 2014 FIFA World Cup. Footballing days started at the age of six for the Prodigy, when he joined Eredivisie team, Sparta Rotterdam’s youth academy in 1997. Georginio blossomed at the club, winning two championship titles in his first two seasons. In 2004 he decided to join the youth academy of Feyenoord, where he trained for another three years before making his professional debut. His performances at the youth level did not go unnoticed as he was invited to represent his country in the for the 2007 UEFA European Under-17 Championship. Georginio then went on to represent his country at the Under-19 and Under 21 categories as well before making his debut with the senior team. Georginio Wijnaldum made his professional debut in 2007 for Feyenoord against Groningen in Eredivisie at the age of 16. This made him him the youngest player ever to play in Feyenoord's first team and was also awarded the Feyenoord's man of the match. The first goal came from his boot in a 6-0 win against Heracles Almelo in the same year. This feat made him Feyenoord's youngest ever Eredivisie scorer. His international debut came in 2011 in a bludgeoning victory against San Marino, where he scored the final goal in a 11-0 win. Wijnaldum spent 4 successful seasons with Feyenoord, making 111 appearances while netting the ball on 23 occasions. In 2011 he was snapped up by PSV where he established himself immediately. He carried his team to victory in the KNVP Cup and was appointed caption ahead of the 2013-2014 season. Although a back injury kept him out of the side for most of that season, he bounced back in the 2014-2015 season, scoring 14 league goals and fours assists. Carrying his team to their first Eredivisie title since 2008, the player was named as Dutch player of the year. 2015 saw him being transferred to English club Newcastle united for a whopping 14.5 million pounds, which made him Newcastle's most expensive catch. The season ended up in diss appointment and relegation for the club, but Georgino emerged as the lone shining star. He appeared in all 38 league fixtures and scored on 11 occasions, thus becoming Newcastle's top scorer. The next season, he transferred to Liverpool for a sum of 23 million pounds and has remained with the club ever since. Appearing 63 times for the club, the Dutchman has 7 goals in his tally. Wijanldum was a regular in the national side immediately after his debut and was a key player in the 2014 FIFA World Cup. Why James Milner and Gini Wijnaldum have a key role to play this season?